Programming For Testers – Its Easy! More details will be available nearer the time at EuroSTAR Conferences. 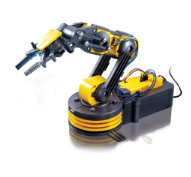 The Webinar will be based upon the Workshop which showed testers enough python code for them to be able to write a program to control a robot arm, full details of which can be found in the post Programming for Testers, and will include reflections from running the workshop at several conferences and seminars. This entry was posted in News and tagged #esconfs on 7th March 2015 by admin.